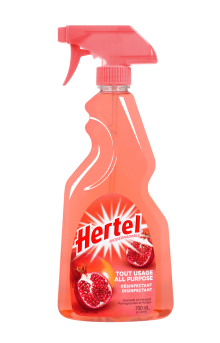 Hertel All Purpose Disinfectant Spray is versatile and specially designed to clean and disinfect your whole house. It easily dissolves grease and eliminates dirt. 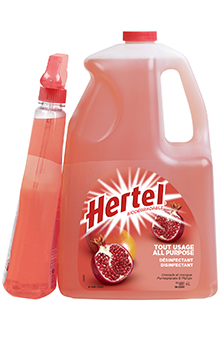 Keep a bottle handy to clean, disinfect and freshen various household surfaces every day. 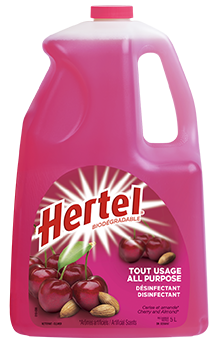 Biodegradable and phosphate-free, Hertel All Purpose Disinfectant Spray leaves a fresh, clean scent. Discover the rich, epicurean scent of perfectly ripened cherries, fused with the sweetness of almond. You’ll surely be transported by your first breath of this exquisite, delicate mix. *Doesn’t contain any almonds. Only artificial scents are used. Two juicy, delicious fruits combine to fill your senses with an exotic, exhilarating scent. The soft, delicate, intriguing pomegranate tames the wild spirit of the sweet mango for a smooth mix. Change of scenery guaranteed! This blend of herbs and fruit is a tribute to the splendour of summer. Lemon embellished with verbana creates a fragrance that is both invigorating and relaxing all at once, and that heightens the senses, while letting the imagination run free. Spray the surface and wipe it with a cloth or paper towel. For heavily soiled areas, spray and let the product penetrate dirt and stains for a few minutes before wiping. 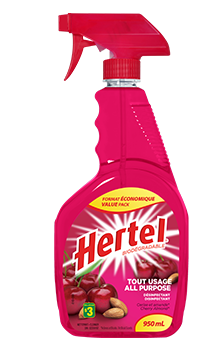 To disinfect hard, non-porous surfaces, spray Hertel All Purpose Disinfectant Spray and let it stand 10 minutes before scrubbing, then rinse and wipe. Heavily soiled areas must be sprayed and scrubbed clean before they’re disinfected. Any surface that may come in contact with food or is within the reach of children of mouthing age must be rinsed following disinfection. 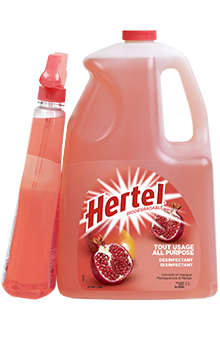 Keep a bottle of Hertel All Purpose Disinfectant Spray handy to clean and freshen various household surfaces every day. In addition to removing dirt, it leaves a fresh, clean scent that you’re sure to enjoy! 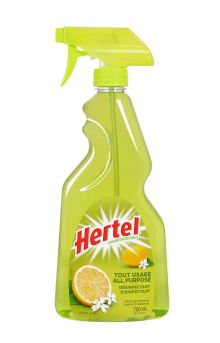 Use one of the Hertel All Purpose Disinfectant Spray fragrances for your regular housekeeping. With their versatility and exhilarating scents, these products enhance the time you spend on this chore! 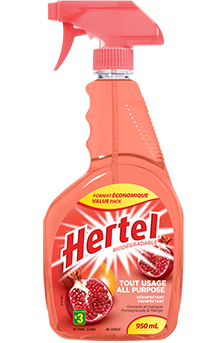 What could be better for daily kitchen cleaning than a product that disinfects surfaces, while leaving a fresh, clean scent? It is ideal for cleaning counters after preparing meals.